Foam blank, 1/2 inch cedar stringer, 1'' cedar tailbock, fibreglass, resin gel coat decor, fibreglass mat fin. 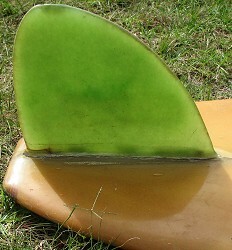 Bottom: Flat with slight lift up on rails. 8 1/2'' x 10'' base x 10'' span @ 1''. Fibreglass mat fin, blue pigment. 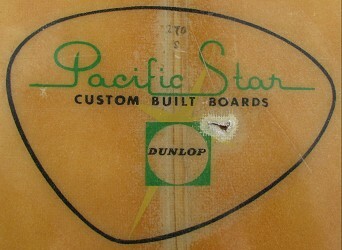 Deck: Pacific Star Custom Built Boards and Dunlop text in offset oval graphic - green and black at the tail. Small, possibly metalic label with illegible text and numerals inserted into the foam on right hand side below the decal (image below, right). Deck: 270 and S - pencil inside decal. 1965 -1966 Surf Permit - red with the centre (indicating the issuing authority) removed in front of fin. Board added to surfresearch collection February 2008, thanks to Mitchell and Matt. Possibly manufactured by a mainsteam manufacturer. Possible connection with manufacturer in New Zealand. 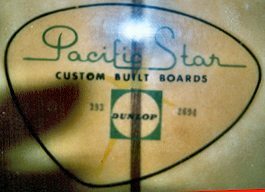 Full page add for Dunlop surfboards with removable slot fin , some of the Dunlop boards were called Pacific Star by Dunlop.